Many people are aware of the dangers of BPA, and this issue has been explored extensively in the parenting blogosphere regarding baby bottles and sippy cups. But did you know that tin/steel cans used for food and some aluminum beverage cans are lined with an epoxy resin that contains Bisphenol A (BPA)? This lining’s purpose is to prevent corrosion and contamination of the food, but what about BPA contamination of the food/beverage? Should we be worried about BPA leaching into our food? According to bisphenol-a.org, the answer is no, “an average adult consumer would have to ingest more than 230 kilograms (or about 500 pounds) of canned food and beverages every day for an entire lifetime to exceed the safe level of BPA set by the U.S. Environmental Protection Agency.” bisphenol-a.org is an industry group, and somehow, I think their information may not be impartial. • Choose soups, milk and soy milk packaged in cardboard “brick” cartons, by Tetra Pak and SIG Combibloc, which are made of safer layers of polyethylene (#2) and also recyclable. Z Recommends has issued their own Z Report on BPA in baby bottles, as well as pacifiers. “Eden Organic Beans are packed in lead free tin covered steel cans coated with a baked on oleoresinous (a natural mixture of an oil and a resin extracted from various plants, such as pine or balsam fir) c-enamel lining that does not contain bisphenol-A. These cans cost 13.77% more than the industry standard cans that do contain bisphenol-A. I’ll be buying more from them! Thanks for the great update on the BPA exposure. We certainly have changed many of our products at home and continue to update ourselves on new products available to us with less or no BPA. Do ALL cans have the lining? Some of the store brand cans we buy don’t appear to have any lining (the inside of the can is metallic, not white). As far as my research has revealed, yes, all tin/steel cans in the US are lined. I contacted the store (HEB) and they said the same thing. They also said that they are pressuring their manufacturer to find alternatives. Guess I wasn’t the first one to ask! Parts per billion (ppb), as mentioned for Eden, is not low enough. The body responds to its own hormones, which bisphenol A is said to mimic, in parts per TRILLION. While I’m not a lawyer, and I think the suggestion for BPA-free cans to be labeled is fantastic, it is possible that in the lawsuit-happy food industry of America this could backfire. 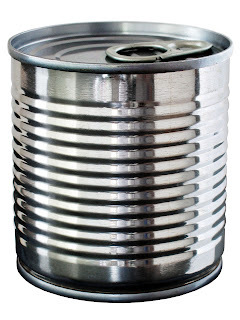 It may create undue burden on canners using BPA linings by forcing them to also ensure their cans are safe – loss in profits of the competition will get them looking for scapegoats. While not “slander” per se, there was big news recently when a meat packer in Kansas wanted to test all beef they process for BSE/Mad Cow to increase confidence with their customers and the right of the Dept of Ag to refuse this practice to occur because of the “undue burden” it would add to the rest of the meat industry, presumably because consumers would demand all beef be tested. Disgusting.. Corporate interests trump consumer safety. The Enviromental Working Group report sited here notes direct links between exposure to Bisphenol-A and prostate or breast cancer and infertility in adult humans. A little is OK? Stop smoking crack! Can I suggest that you (everyone) take a look at http://www.stats.org. It’s a George Mason university site that examined the whole BPA issue as a third party. It is remarkable reading. In short, the media, and even the new media here in blogs like this one, are guilty of chicken little behaviour and not digging into an issue — but instead just regurgitating rumor and innuendo for readership. All the BPA tests that showed a problem (literally 100%) were studies in which animal subjects were INJECTED with BPA. In all the studies in which BPA was orally ingested, even at ridiculous levels, there was literally no problem. That appears to be because our digestive system pairs up a sugar molecule with the BPA molecule and it gets excreted in urine. This whole thing is a farce. I’m no scientist, but you can’t use an injection study to simulate an ingestion risk. The only thing worse than an untrustworthy government, is untrustworthy media. Due diligence folks!! The only canned food I use is Native Forest Coconut Milk and it is also BPA free. I’m assuming the rest of their products are too. All I can say about “Mike C’s” comment, is don’t stop researching because of what he said…..the proof is everywhere about how damaging this chemical is….what amount will you put in your kids? How much is okay to you? This needs to be removed from anything that comes in contact with food that we put into our bodies. We can go back to the oleoresinous c-enamel that does not contain the endocrine disrupter chemical, bisphenol-A (BPA). Lets do it!! !